We had another great weekend! Abby joined the YA lit book club that I participate in with a group of teachers from our school. We have meetings once a month where we eat food, talk about life and discuss the book we read. That evening we hung out with friends at a BBQ on one of the rooftops. Abby got to meet a bunch of new people and we made lots of yummy food (4 dishes for our two events!). Yesterday was a day for the record books. We left the apartment about 12:30pm to meet up with a friend, do a little geo-caching, eat some bread and shop at Marina Crescent and Mall, check out a Co-Op and find a craft store (we found yarn!). Jeff left during the shopping to play frisbee. Abby and I got home about 7:30pm. Except for the time we spent eating bread and ice cream, we were on our feet the entire 7 hours! We were really interested in how far we walked and were shocked when we figured it out. Aren’t we awesome?! I wrote this post on Friday and then had technical difficulties with the video 🙂 You will now see why I posted a password protected post (see end of post). Last night at the Halloween party Jeff and I drank very responsibility (i.e. nothing). We may or may not have eaten some very tasty desserts though 😉 That allowed us to wake up quite refreshed this morning! After an hour of lounging, I got myself motivated, made my green smoothie and headed out the door to the gym! We were busy with Halloween festivities so we skipped working out Wednesday and Thursday and I was determined to get my sweat on. I felt quite accomplished after attending BodyAttack 🙂 After the gym, I had a very important mission – buy an eyebrow ring! Mine completely feel out and was lost early last week. My 10-year old piercing was slowly getting closing up and I was having none of that. So…I headed to the mall (~20 min walk from the Corniche). I was successful in buying a pack of eyebrow rings…they are too big & ugly, but something is better than nothing! I also stopped at Bath & Body Works to check out their 3 candles for 12KD special. It was quite successful, but I also ended up meeting a fellow American! When I walked in one of the employees was speaking with a very familiar accent. I think she heard my accent too and came over to talk to me. I smelled hundreds of candles (at least it felt like it) and had a pretty great convo with her! She has lived in Chicago for the last 6 years and is currently traveling the world visiting Bath & Body Works stores for the company. She is in Kuwait for 2 weeks by way of 3 weeks in Poland and several other cool places (I don’t remember them all). I can’t exactly put into words exactly what she does, but what I understood is that she visits stores outside the US and helps them do business more like the stores in the US. She said it’s been really interesting to visit different countries and see how different it is (culture, business, the stores). She also had good things to say about Kuwait which was good to hear! I think she’s most likely here to help with the opening of the new Bath & Body Works in Phase 3 of the Avenues. It opens next week and we’ll be eager to explore it once the hype dies down. The Kuwaitis love their malls! The point of this post is that I made a video as I was walking around (from the gym to the mall, in the mall and back home). I hope you enjoy sharing my walk! 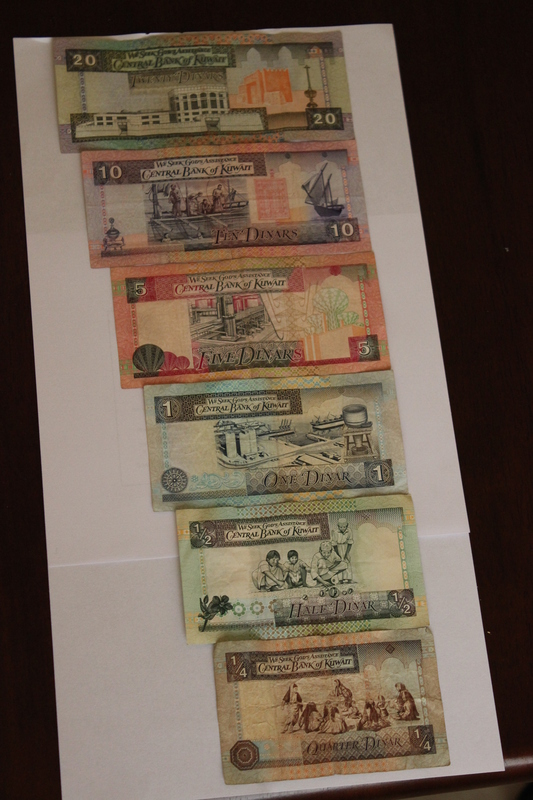 After 2.5 weeks, we’re still trying to wrap our heads around our new money…the Kuwaiti Dinar. AIS gave us a settling allowance…in cash! When we had it in our hands, it didn’t seem like very much. But then when we started doing the conversion, we realized it was a lot! On our first trip to the grocery store during orientation (more to come soon), we were quite confused by the prices. We’re still in the process of adjusting and trying not to constantly convert to US dollars in our heads. The Sultan Center is one of the major grocery stores here. Other notable ones are Lulu Hypermarket and Carrefour. We’ve found a Sultan Center that is very close to our gym (again, more to come soon!) and we can easily stop on our walk home. It has quickly become our favorite place to grocery shop! 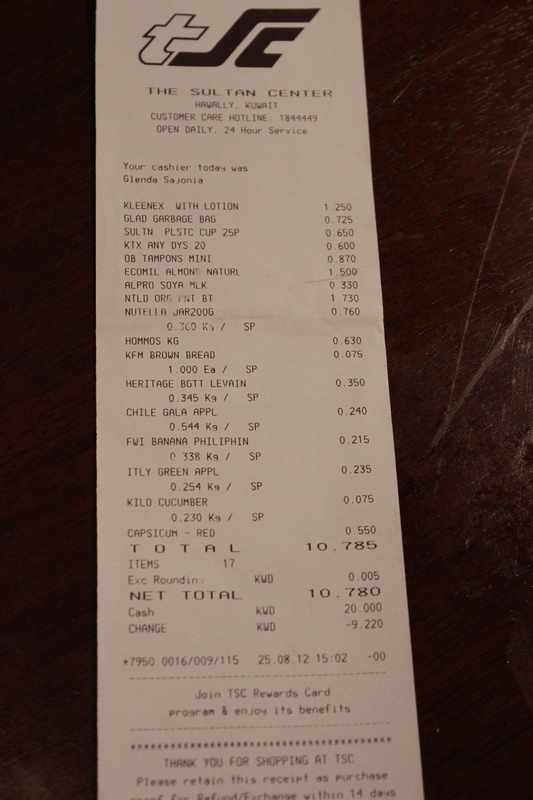 Receipt from our first trip to the grocery store (Sultan Center). There are 1000 fils in 1 dinar (like there are 100 pennies in 1 dollar). One dinar is about 3.55 dollars. We’ve heard it doesn’t fluctuate much. The smallest bill is 1/4 dinar (250 fils); the biggest (that we’ve seen) is 20 dinars. 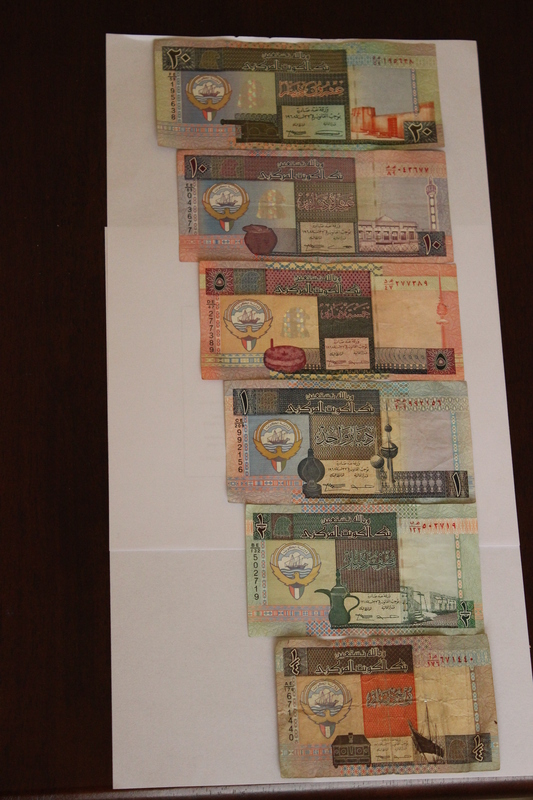 Arabic side of the dinar bills. English side of the dinar bills. Front side of coins (fils). 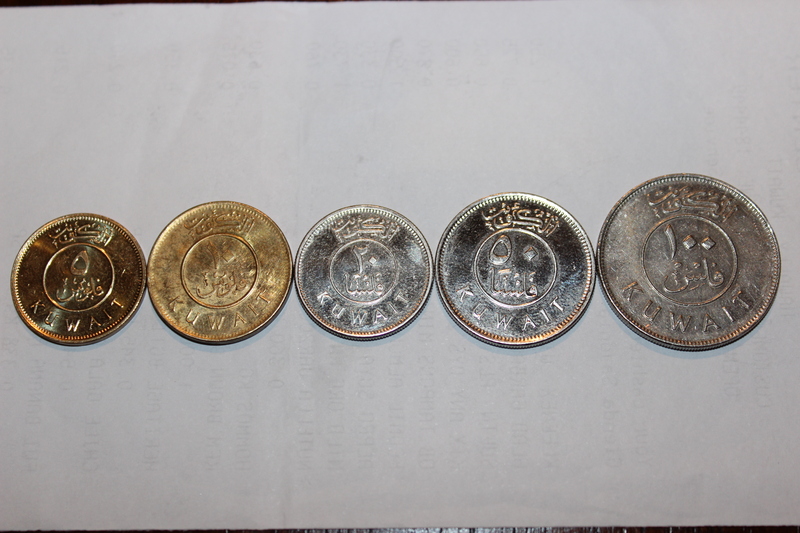 Back side of coins (fils). 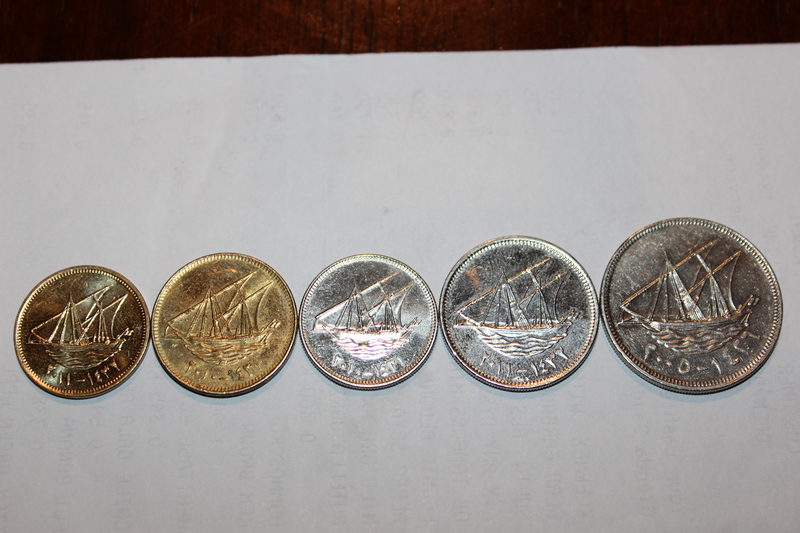 The coins are incredibly small and range from 5 to 100. They also don’t have any numerals on them that we are used to seeing…so we’ve had to quickly learn some Arabic numerals!